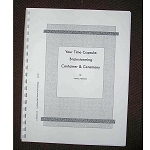 Here find our Books and Pamphlets dealing with long term storage and time capsules. Learn more about how to think about a time capsule container, how to choose items to put inside of a time capsule, and how to keep the items nice during their stay in long term storage. 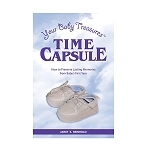 If you are doing a time capsule for a baby - you need this book. It gives lots of info on how to take care of baby things in storage, too. Free Shipping. Ships promptly! Get this leaflet first when considering a time capsule project! Free Shipping. Ships promptly! 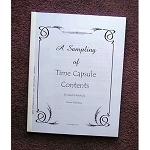 Best leaflet to get when considering how to preserve items for a long time in a time capsule Free Shipping. Ships promptly! 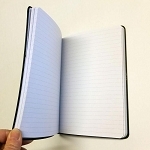 Best little time capsule book to give you ideas of what items of your own to put into a time capsule! Ships promptly. 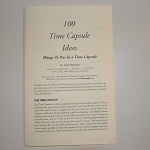 Buy this book to get lots of ideas on Time Capsule Contents. Now includes the 100 Ideas Booklet as a bonus! Ships promptly! If you need to plan a time capsule event, get this book and it will help get you started. 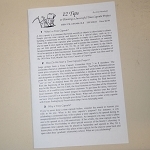 Bonus 12 Tips Leaflet included.